Obviously, "almost" is a key word here, but apparently NASA still has "small secret contingency plan division" which is dedicated to preserving "Orion" nuclear propulsion technology - and reviving it in case of a killer asteroid threat. To the stars - one nuke at a time! 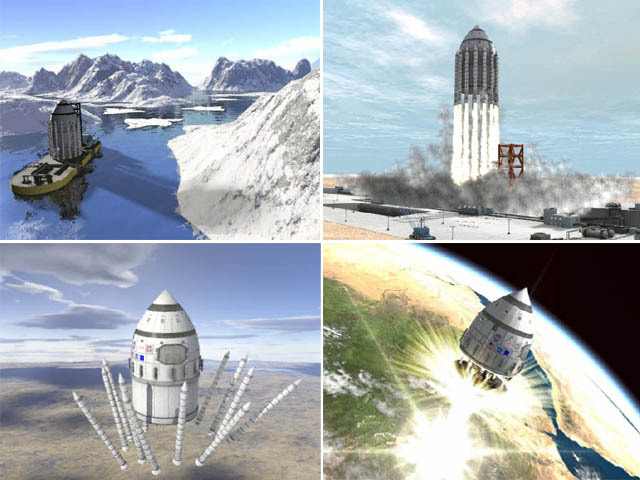 Various mission profiles for "Orion" were considered, including an ambitious interstellar version (asteroid defense and mining were among other ideas). This called for a 40-million-ton spacecraft to be powered by the sequential release of ten million bombs, each designed to explode roughly 60 m to the vehicle's rear. What!? You wanna put 1000 nuclear explosions behind my back? - the ship could explode on the launch pad, or before reaching orbit, endangering whole areas on Earth. 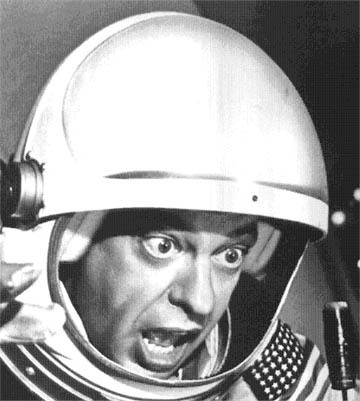 - the radiation levels for the space pilots were pretty significant. Parts of this project still seem to be classified today. George Dyson recollects: "NASA had no interest, they tried to kill the project. The people who supported it were the Air Force, so they made it top secret..." It is still very dangerous and touchy subject, mostly because of the heart of the project - controlled ways to get directed energy explosions, and directing nuclear explosions at the ship. Unpublished documents - a set on Flickr. Tech historian George Dyson collected these papers, written a book "Project Orion", which chronicles the project and the lives of the scientists behind it - including his father, Freeman Dyson (remember the Dyson' Sphere?). "But hey, it does make more sense than the space shuttle, so things are looking up", says George Dyson. think there was a bbc documentary on this. called to mars by abomb. they had footage from a small scale model test. it does work. interesting because it takes the worry of weight out of the equation. instead of saving weight you build massive ocean liner level stuff because it no longer matters much. You'd think this project would immediately be called off instead of going as long as it did just by the fact that you'd severely pollute the atmosphere. With a clean fusion bomb fallout wouldn't be a problem but yeah with dirty nukes, Quote: "Freeman Dyson, group leader on the project, estimated back in the '60s that with conventional nuclear weapons, that each launch would cause on average between 0.1 and 1 fatal cancers from the fallout." Anonymous, as far as I know a H bomb is only "clean" because its fallout is small in relation to its destructive power. You still produce more than enough fallout simply because a fission bomb is needed as a detonator for the fusion. There is no clean nuclear weapon. 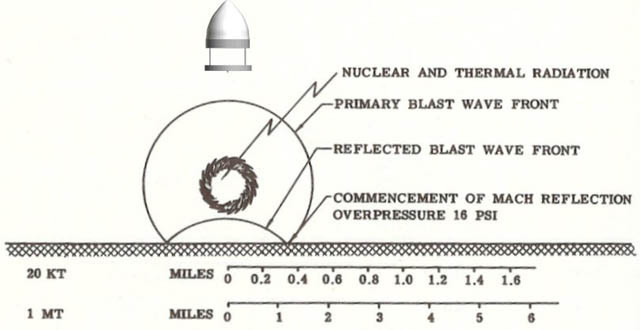 The term "dirty nuke" can either refer to a fission bomb with relatively high fallout due to low efficiency or to a conventional chemical explosive with radioactive material around it. The latter thing does not cause a nuclear explosion, but scatters radioactive debris around. It is in no way suitable to power a spaceship. You have to remember the TIME this was invented in.... people seriously thought this planet was going to be obliterated by nuclear war in the 1950s-60s. And if there is a killer asteroid or extraterrestrial threat of any kind, it would be a last-ditch, everyone left behind is dead anyway, "When Worlds Collide" type of project. The interwebs have been absolutely abuzz with talk about this project. I've seen it in a few documentaries and more than a few posts. I did love that TED talk tho. There is no reason why we simply couldn't assemble such a device in Orbit and let fly from that vantage point. 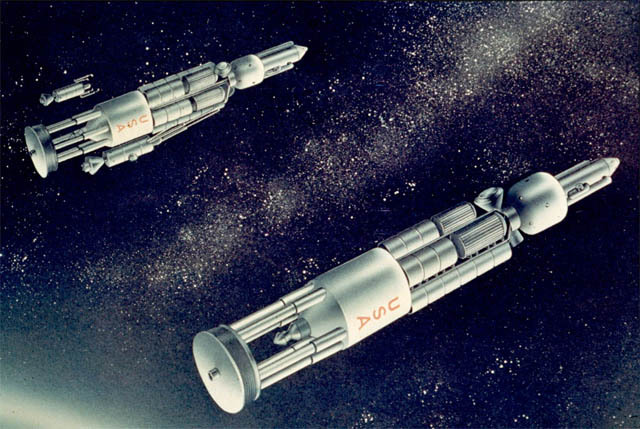 Project Orion and NERVA should be group projects for graduate Nuclear Engineering students. There should be ways to vastly improve performance and lover costs on both of theose systems. Launch from Earth? Of course not. 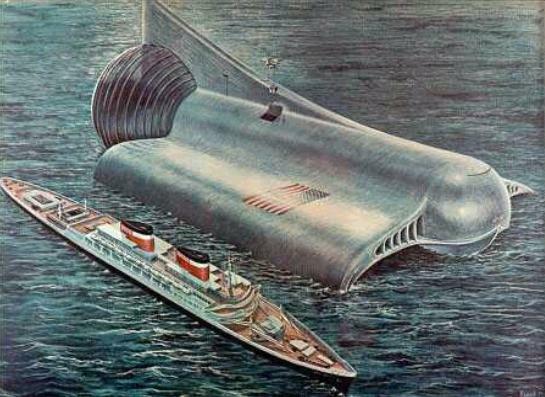 However, as anyone who has ever read SF knows, space ships are most easily built in space. 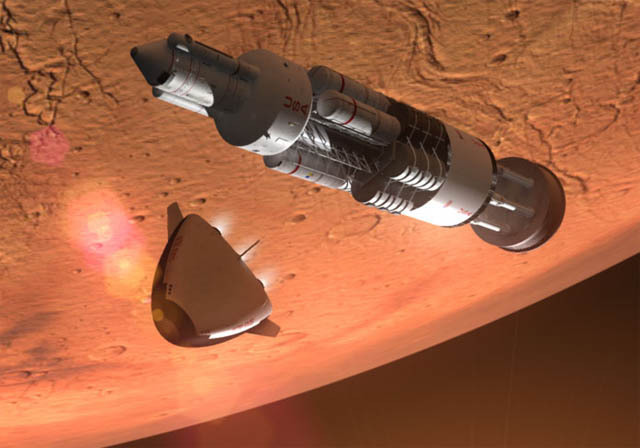 The cuts in time to Mars and beyond will prevent a lot of radiation problems. Oh yes, exploding atomic bombs in space will pollute it. How could I overlook something like that. Darn! Remember, the Sun is a natural nuclear fusion explosion that's been going on for about 4.5 billion years. Aside from that, all matter emits some miniscule amounts of radiation. Getting a sun tan is in fact a radiation dosage. And burning coal puts a lot of uranium in the air, since it's a trace element in coal. So an Orion ship's radiation should be kept in perspective. Building it in space removes most of the risk to earth. 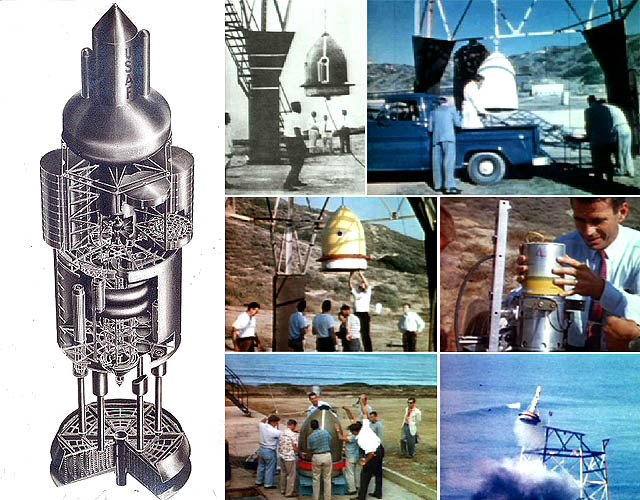 And Orion or a Nerva type nuclear rocket (much different) open the whole solar system to human exploration. Instead of trips lasting years one can get around between planets in weeks. Eventually we're going to have to accept that politically. Project 'Daedalus' from Great Britain was similar to this one. Read Footfall! Great read too! I've been a fan of Orion for decades. It's one of those Big Engineering concepts many engineers (and I am an engineer) are fascinated with. Adding to the attraction, the only thing keeping it from working is an international treaty. Project Pluto isn't nearly as big, but has the advantage of being dead simple overall. One person working on it described the vehicle as being "...about as complicated as a bucket of rocks." A ramjet is a very simple heat engine: cold air in, hot air out. For Pluto, the heat source was a nuclear reactor made from advanced ceramics, glowing bright yellow. They ground tested a developmental version of the engine, and seriously discussed building a test vehicle. That would have been dumped in the ocean after the flight. The realization that if they lost control of the thing it could fly over an inhabited area killed the idea. It's not a bad idea once you get off-planet. Someday, one of the export products spent up the space elevator will be nuclear bombs to propel enormous interplanetary vehicles. this kinda thing is also a significant plot point in neal stephenson's anathem! that's where i first heard about it. It's not a bad idea once you get off-planet. Someday, one of the export products spent up the space elevator will be nuclear bombs to propel enormous interplanetary vehicles.. 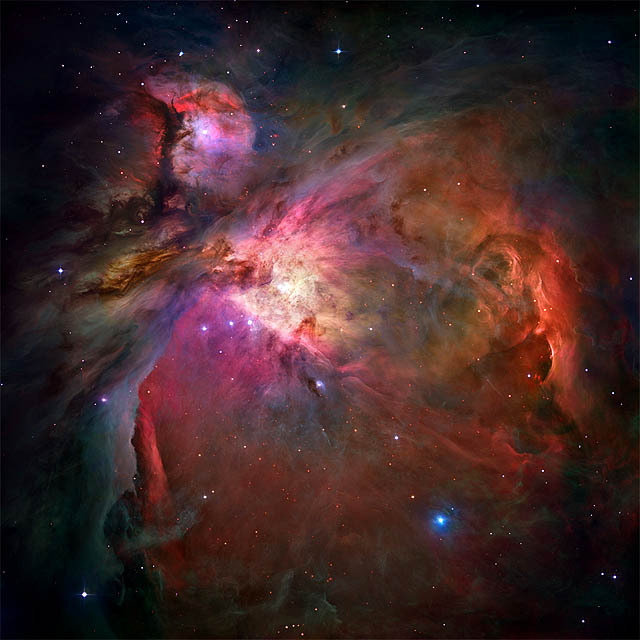 The idea that Orion is inherently unclean is untrue. The reason a bomb can be dirty is the stuff that gets sucked into an explosion (including bomb casings) and then spread around. That is why normal ground-level detonations (where dust and soil gets sucked in) produce vastly more fallout than airborne ones. In the late 50s, the calculation was 1 to 10 premature deaths per ground launch of Orion. That isn't 10 specific people die - but that 10 people would statistically die earlier than they otherwise would have. I personally do not think that risk is unacceptable. Many thousands, perhaps hundreds of thousands, perhaps even millions, of people die prematurely every single year because of industrial pollution from cars, factories, industry etc. Likewise hundreds of thousands of peoples are killed or injured in road accidents, every single year. While these are tragic, nobody says the risk is unacceptable and we better give up cars/industry/technology and return to living in caves. Anyway, another point is the risk can be further reduced today. A modern Orion would use a ground-based pusher plate to reduce fallout, and would use better/lighter bombs so less casings to be sucked in too. The two remaining problems are EMP (electro magentic pulse), legal and political. The EMP problem can be solved by a sea launch say near the South pole. The legal issue is that it is illegal to take nuclear weapons in space or explode them - but this could be resolved by renegotiating international treaties if there was political will. The political problem is the biggest problem - many people, often regardless of how little they know about nuclear technology and nuclear science, are against anything nuclear, because it sounds bad to them or believing too much bad late night scifi. 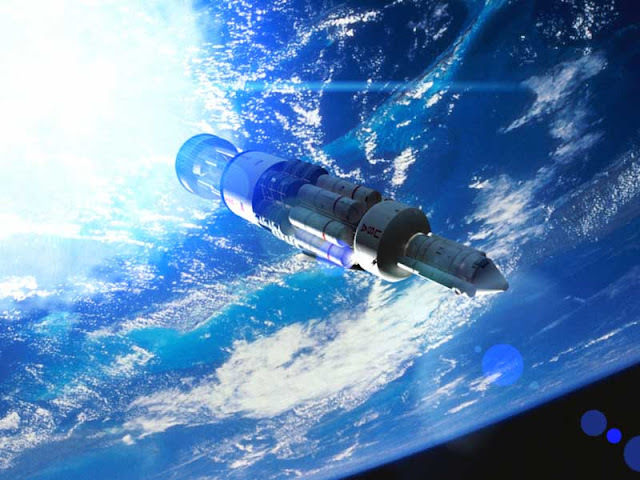 The reason we need Orion is its the only way we can get a substantial presence in space. One Orion is equivalent to hundreds, even thousands, of conventional rocks. If we don't start using energy and resources from space (the first step of which is a large presence beyond the Earth), we are going to wreck this planet before too long. 1. materials don't BECOME radioactive do they? the dust and stuff from a ground explosion doesn't contribute to the "dirtyness" of the bomb does it? 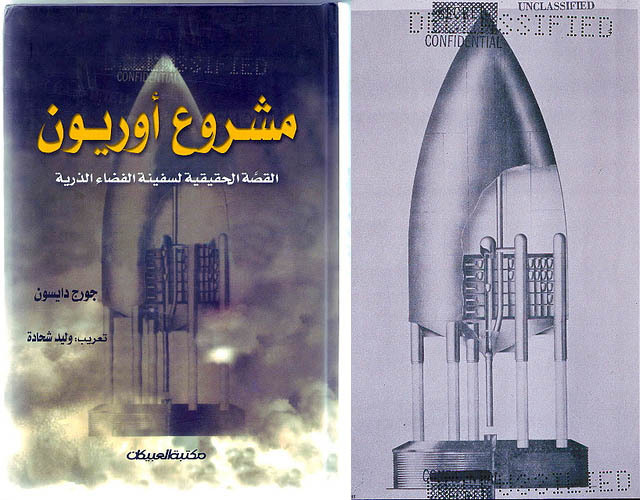 2. why on earth would you LAUNCH with nukes? 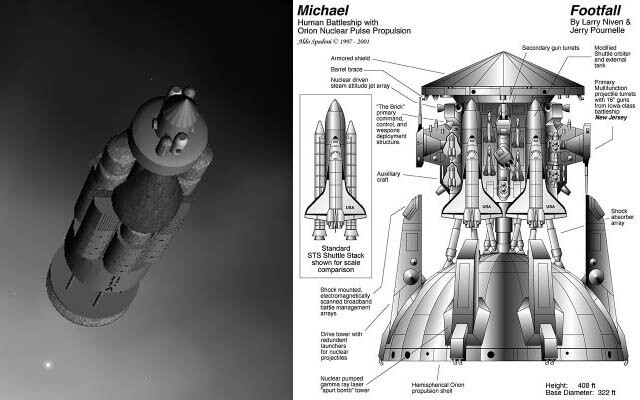 just use conventional rockets to get the thing into orbit (or just build it there) and then you can nuke away in space. That 01-1-10 deaths figure would presumably have been calculated on the LNT (linear no threshold) theory of radiation damage. While that is still politically accepted the hormesis theory that at a low level radiation is actually beneficial has the evidence going for it. Did a speech in 80's including this method as alternative to STS. Also included matter/antimatter propulsion. Only problem I foresee is NASA's history of accidents! That would be huge..
what a waste. why they didn't use more sensible inertial drive. its most idiotic to blast behind spaceship when there are lots of other ways to do it. the main goodness of inertial drive is that it can be used in closed system, there is no need for interaction with outside-spaceship environment. I would argue that a clean fusion bomb would be possible, if it could be detonated without a fission trigger. This is theoretically possible, but I've never heard of anyone being able to do it. 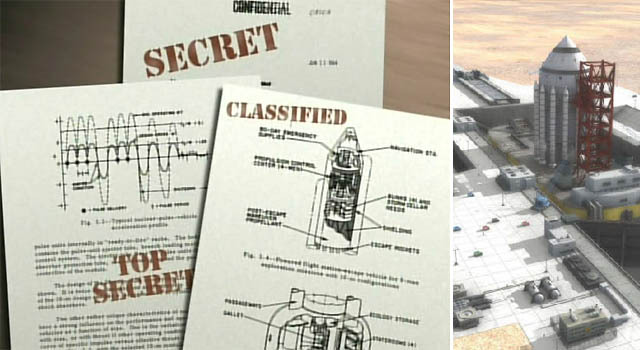 If it could actually be done, it would naturally be top secret, to avoid terrorists/enemies etc exploding cheap nukes that don't require difficult to obtain plutonium or U235. No doubt it would be too big and clumsy to make a useful weapon, but it wouldn't really matter to Orion if each propulsion unit weighed a couple of tons. A few important points to let us really appreciate Orion. If a dinosaur-killer were on a trajectory on the way in, we could do even the big ugly ground launch ships up to 16,000 tonnes at lift-off. 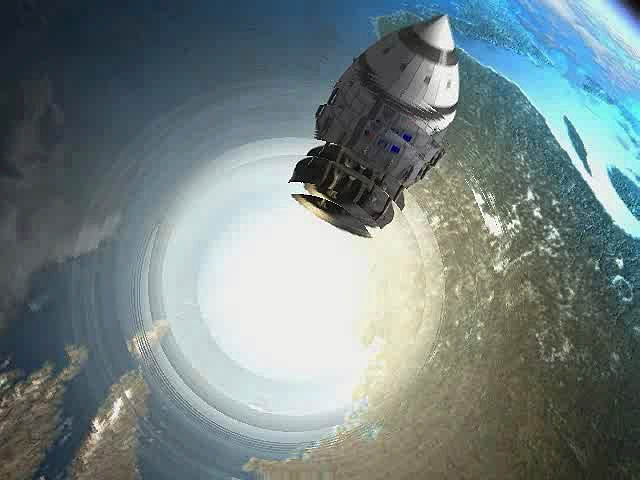 Dyson determined that they would add a few percent to the amount of fallout being released into the biosphere back then, for a series of ≈5000 tonne ships over a decade or so. "Mars by 1965, Saturn by '70" was what they hoped. Lacking such an existential threat and in the modern era, we could still lift a smaller ship sectionally to orbit, so it's only fired off above the Van Allen Belts, if anything above LEO matters. A cargo ship (made up of several Saturn-V class boosters' loads in LEO) for the mission package goes out on a minimum-energy trajectory and goes into Mars orbit with over 75% of the mass in LEO being payload. The crew go when the two planets are physically closest, taking 21 days to jump across to Mars and brake from cometary speed into orbit. In a ship consisting mostly of pulse units, with a hab just as big as they can cramp into for the run. If we take care of the trash and don't leave huge radioactive trash heaps lying around as the cold warriors did making the pits and tritium of their weapons, our effect is to blow weapons-grade fissionable fuels away into the Solar wind, opening up the Solar system. Hopefully proving the way to removing all the heavy, polluting industry off-planet for a hopefully indefinite future for Human and all Gaian life. Space colonies as far out into the Kuiper belt & beyond are possible, only needing a bigger mirror. The Penn State Physics dept have a paper about anti-proton catalyzed sub-critical mass of U235, micro-fission pulse rocket. A telescope array at 520 AU, using the Sun's gravitational lens, could see Earth-sized planets or storms on Jovian planets, at the distance of the Galactic Core regions. A good reason for a research institute. O'Neill worked out an iteration of the early Island One Bernal Sphere colony with a mirror mass limited to no more than 3X the GCR shielded hab at 720 AU (4 light-days) as an arbitrary "continental shelf" for habitats around the Sun. Even so far out, such comet-eating colonies aren't forever completely physically out of touch with other colonies or Earth. Modernized advanced versions of Dyson's Super Orion (possibly Magnetic Sail-coupled instead of physical interaction with the plasma jet from the bomb) make lousy starships with only .1C Δv. Still, that makes a ship which at cruising speed, covers 200 AU in 34 days. eventually becoming the vanguard of interstellar colonization, even if many generations removed from Earth. Out there, the Sun is only a partricularly bright star, and there are others brighter to point your mirrors at. A colony of 500 to have a high-energy standard of living needs mirrors that would span from Gibraltar to Lebanon, the Alps to North Africa (but it's only a few moles' thickness film). If any colony can be sustainable for long enough to get to the next icy chunk to replace losses and grow & reproduce. It has to be able to make everything they need or be dependent on commerce. A particular ship & crew or colony & population would never make the trip between stars (until technology advances) but anywhere industry is possible and fissionables and propellant are available, the ships keep them in touch with their neighbors.